In the “nAvEkshasE” SlOkam , the kAraNathva (bhagavAn being the cause of everything) which is explained in vEdhAntha sUthram 1.2 “janmAdhi asya yatha:” (brahmam is the one from whom creation etc occurs) is highlighted. In the “svAbhAvika” SlOkam , the principles [importance of bhagavAn’s qualities] explained in guNopasamhAra section [section which deals with experiencing bhagavAn with all his auspicious qualities] of vEdhAntha sUthra are highlighted. In the “ka: SrIS Sriya:” SlOkam , the principles explained in the 3rd chapter of vEdhAntha sUthra are highlighted and in “vEdhApahAra” SlOkam , the principles explained in upabrumhaNam (ithihAsas and purANas) are highlighted. In the “kasyOdharE” SlOkam , supremacy established by logical reasoning which follows the line of SAsthram is explained. Now, in this SlOkam, while this is clearly established through authentic texts, as said in SrI bhagavath gIthA 16.20 “AsurIm yOnimApannA:” (being born as asura), thinking “alas! these demoniac people are missing out on him!”, feels sorrow for the loss of such people. Alternative explanation – Let this distinguished lord be not seen by demoniac people as said in thiruvAimozhi 1.3.4 “yArumOr nilaimaiyan ena aRivariya emperumAn” (emperumAn is such that he cannot be perceived by [envious] people as “He is of such qualities”). through the opinions of those who know in truth about the renowned lord. 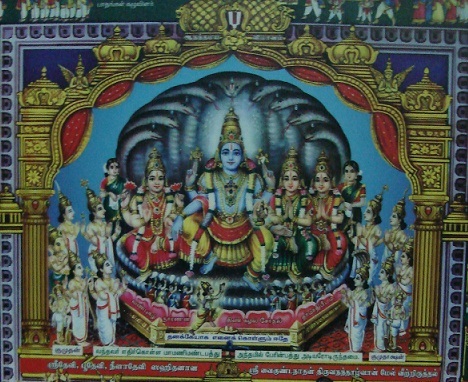 thvAm – You who is superior to all, and apt [lord] for this jIvAthmA. Seela – As said in “Seelam hi nAma mahathO mandhais saha nIrandhrENa samSlEsha:” (Seelam means, a great person mixing freely with an inferior person). The nature [of lord] that is explained in “nAvEkshasE” SlOkam. That is, though he is sarvAdhika (greater than all), considering the loss and gain of the jIvAthmAs as his own, taking up their uplifting on himself as said in chAndhOgya upanishath 6.2.3 “bahu syAm” (Let me become many). rUpa – The form which is described as “ka: puNdarIka nayana:“. chAndhOgya upanishath 1.7 “hiraNyaSmaSrur hiraNyakESa ApraNakAth sarva Eva suvarNa: | thasya yathA kapyAsam puNdarIkamEvam akshiNI ||” (bhagavAn having gold-like shining moustache, gold-like shining hair and limbs; his eyes resemble a lotus blossomed by the sun); nArAyaNa sUktham 11 “neela thOyadha madhyasthA vidhyullEkEva bhAsvarA” (Shining like a lightning in the middle of a cloud); mahAbhAratham SAnthi parvam 206.60 “na bhUtha sangha samsthAnO dhEhO’sya paramAthmana:” (The divine body of paramAthmA is not made of the five elements (earth, water, fire, air and ether)); varAha purANam 14.41 “na thasya prAkruthA mUrthir mAmsamajjAsthi sambhavA” (He does not have a body which is connected to material nature, which is made of flesh, bone marrow, bone etc) and so on. charithai: – and by the divine activities which are beyond human capability as highlighted in “krAnthvA nigIrya punarudhgirathi” and “vEdhApahAra guru pAthaka“. parama prakrushta sathvEna – and by his abode which is made of pure goodness as said in “parama sathva samASraya: ka:“. rig ashtakam 5.6.24.12 “kshayanthamasya rajasa: parAkE” (in paramapadham (spiritual realm) which is beyond the mUla prakruthi (primordial matter) which has rajO guNam (passion) etc); purusha sUktham uththara anuvAkam 2 “thamasa: parasthAth” (beyond the primordial matter); SrI pAncharAthram “svasththAdhArakam sathvam miSrasthvAth vilakshaNam” (pure goodness which sustains others, and which is different from goodness which is mixed with passion and ignorance) and so on. sAthvikathayA prabalaiScha SAsthrai: – by the portion of vEdham which gives good advice to sAthvika (virtuous) people. By strong/firm SAsthrams as indicated by brahmA in the mode of goodness in SrI mAthsya purANam 53.63 starting with “agnE: Sivasya mAhAthmyam …” (when in the mode of ignorance, agni, Siva are glorified) and highlighting “sAthvikEshvatha kalpEshu mAhAthmyamadhikam harE:” (when in the mode of goodness, vishNu is glorified). prakhyAthadhaiva paramArtha vidhAm mathaiScha – By the principles of the knowers of the renowned lord [great personalities such as parASara bhagavAn, manu, vEdha vyAsa, SrI Saunaka, Apasthamba, vAlmIki and so on]. SrIman nArAyaNan is well established as the supreme lord in srushti vAkhyam (the sacred hymns relating to creation), nArAyaNa anuvAkam (sUktham), subAlOpanishath, antharyAmi brAhmaNam etc. thvAm Asura prakruthaya: – those with cruel activities, about your highness who is superior to all. bOdhdhumEva na prabhavanthi – They are not capable of knowing you. SrI bhagavath gIthA 16.20 “AsurIm yOnimApannA:” (being born as asura) and so on. This entry was posted in Other, sthOthra rathnam on December 28, 2016 by Sarathy Thothathri.